Round 4 (out of 6) of the 2004/05 32nd scale BOC took place at the fast Timaru track near Margate in deepest Southeast Kent (basically nearer to France than anywhere else) so it was good to see a healthy turn out of 15 racers for this first ever BOC at Timaru, including a strong contingent from Blackpool, the Margate of the North West! By all accounts Saturday night was an event in itself. I hope that Paul Shepherd has managed to clean the blood from his shirt! A couple of "old" faces were in evidence. Trevor Crout of body moulding fame delivered some new bodies to Brian Saunders during Saturday practice and former multiple national and international champion Dave Harvey making a foray out of retirement on Sunday for the saloon and sports classes as Timaru is the nearest BOC track this year to him. BSCRA Chairman Brian Saunders relieves former champ Dave Harvey of a cheque for his BSCRA membership on his return to the British Open Championship. Dave Harvey was using borrowed cars courtesy of Timaru member Alan Callaghan (saloon) and Vince Lee (sports) and soon made it clear that he had lost little of his speed over the years with two fast saloon heats which were only beaten by Paul Shepherd in his second run. The D Final was won by John Hyde from Alan Humphreys and Colin Jackson who retired with car problems. In the C Final, Steve Sargent and Graham Woodward had a terrific scrap which Steve ultimatley won. Vince Lee was not far behind whilst Martin Ellis retired. Brian Saunders won the B Final with a score good enough to grab third overall with Neil Obee second (grabbing 4th overall) and Mark and Greg Harwood some way further back. The A final was a two horse race betwen James Cleave and Dave Harvey, with James running more consistently to win by 4.5 laps. Paul Shepherd and Paul Harwood finished third and fourth to take fifth and sixth overall. 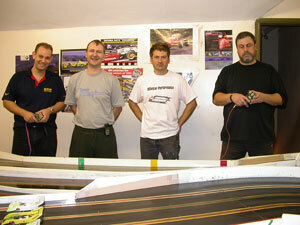 Saloon A Final, James Cleave, Paul Harwood, Dave Harvey and Paul Shepherd. 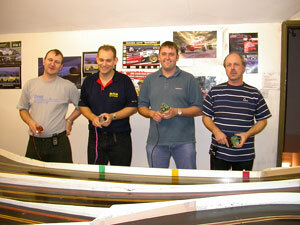 Paul Shepherd, James Cleave, Paul Harwood and Neil Obee qualified easily fastest for the F1 A Final. Gear suppliers did a roaring trade as F1 gears seemed to strip in almost every heat, often within inches of starting the warm up! The D Final was won by John Hyde from Alan Humphreys and Colin Jackson Whilst the C Final was easily won by Vince Lee from Martin Ellis and retiree Mark Harwood (both finals with three runners). The B Final was closely fought between Steve Sargent and Brian Saunders, running at much the same pace until Brian got to the dreaded red lane. Graham Woodward pulled out all the stops on his final white lane with the fastest segment of the B Final to finish less than half a lap down on Brian. Steve Sargent's total distance was good enough for fourth overall. The A Final was very closely contested between James Cleave and the two Pauls, Shepherd and Harwood. A scintillating 39 laps on red lane for Paul Shepherd was good enough to make up for a poor yellow and grab the victory by half a lap from James "Mr. Consistency" Cleave. Paul Harwood was only another half lap behind, with Neil Obee fourth but fifth overall. 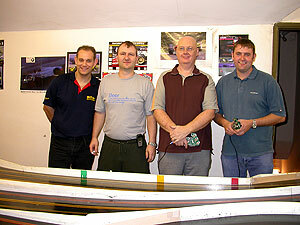 Formula 1 A Final, Paul Harwood, James Cleave, Paul Shepherd and Neil Obee. The Timaru Club does not run its sports class to current BSCRA spec so we suspected that the 41 lap 3 minute sports car record might be vulnerable but everybody was surprised by Vince Lee's 45.41, nearly 2 laps faster than second place qualifier James Cleave (or "f.....g awesome" as Paul Harwood succinctly described it). The D Final consisted of Dave Harvey, Colin Jackson and Alan Humphreys after Dave had a couple of disastrous heats with car troubles. However, he gathered it all back together and recorded an average of nearly 42 laps per segment. Would this be fast enough to win? The C Final saw Steve Sargent win comfortably from Graham Woodward, Martin Ellis and John Hyde. In the B Final, Greg Harwood charged really hard just to pip Dave Harvey's score (and get third overall with Dave fourth) and win comfortably from Paul Shepherd, Neil Obee and Mark Harwood. Vince Lee decided to start on red in the A final and almost immediately regreted that decision as a series of crashes eliminated his chances. Vince had some consolation as his F1 McLaren won the Best Presented Car Trophy. Brian Saunders' day went from bad to worse as he hit big problems too to finish last overall and through the carnage came "Mr Consistency" Cleaves and Paul Harwood, charging as hard as his brother in the previous heat and just beating his score and grabbing second overall. 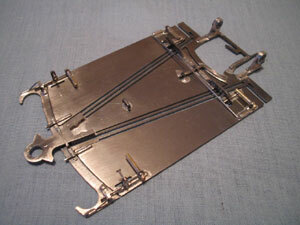 Thanks to James Cleave for this photo of his winning Richard Mack designed sports chassis. Sports A Final, James Cleave, Paul HArwood, Brian Saunders and Vince Lee. 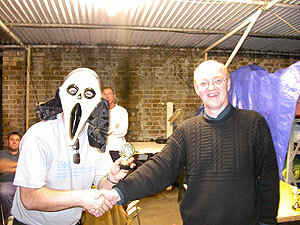 Paul Harwood (post face lift - well it was Halloween) receives trophies from Alan Callaghan. 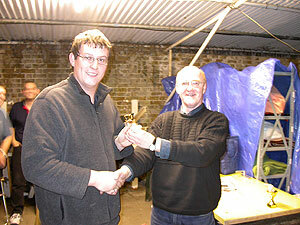 Twice Div 1 class winner Martin Ellis receives his trophies from Alan Callaghan. 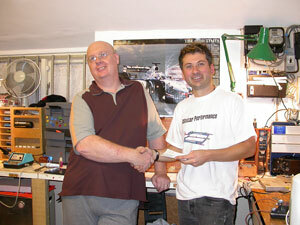 Thanks to Chas Keeling at SCD for prompt service on the trophies and support with the prize "goodies". We'll look forward to seeing you all again in 2 years!